World-class Filipino boxer Manny Pacquiao is on his first visit to Korea, spending the Christmas holiday season here with his family. The southpaw pugilist arrived at Incheon International Airport early Friday and held a press conference at The-K Hotel in Seocho-gu, Seoul. He plans to meet fans and participate in a charity bazaar at the hotel on Dec. 24-25, where he will sell personal items he used in training, including gloves and shoes. "I visited Korea to experience the snowy winter with my family," the boxer, 38, said. He said Seoul recorded minus 2 degrees Celsius on Friday and was "really cold." The fighter mentioned Korean actor Kim Bo-sung, who debuted in Mixed Martial Arts earlier this month, losing to Japan's Tetsuo Kondo in a charity fight on Dec. 10. Kim, 50, suffered an orbital wall fracture to his eye socket and temporarily lost sight after Kondo struck his right eye. Pacquiao said he was "greatly impressed" by Kim and, moved by the fact the star had fought on despite an existing vision problem in his left eye, said he wanted to meet him during his visit. 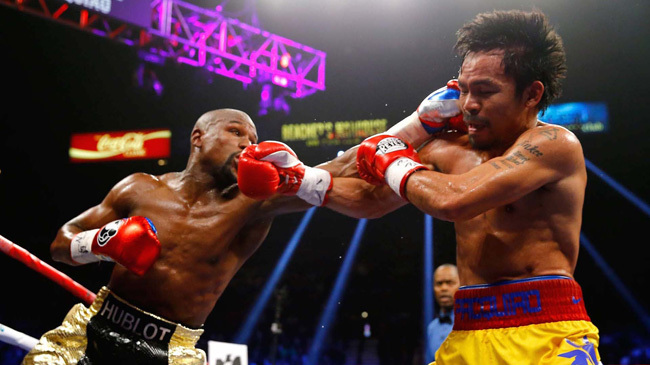 Pacquiao hinted at the public appearance of his wish for a rematch against America's Floyd "Money" Mayweather Jr., who beat the Filipino in a 12-round unanimous decision in May 2015 and retired. He also told Korean journalists about his busy political career as a senator in his country. He doubted he would run in a presidential election because he "already has a hefty responsibility as a senator" and "still enjoys his life as a boxer" after revoking his retirement announcement in April. Considered one of the greatest boxers ― he is the first and only eight-division world champion ― Pacquiao has won 11 major world titles. He also was named "Fighter of the Decade" for the 2000s by the Boxing Writers Association of America, the World Boxing Council and the World Boxing Organization.